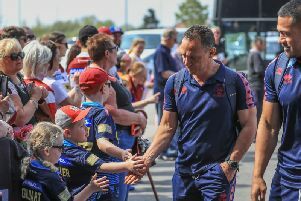 Steve McNamara was furious after he watched his Catalans Dragons side whimper to a big defeat against Wigan Warriors at the DW Stadium on Sunday. Catalans - who had defeated Hull KR and Leeds Rhinos in their last two outings - looked out of sorts the 42-0 onslaught. “We were completely beaten in every department by a team that was really hungry and energetic while we were the exact opposite,” he said. “We’re not good enough to underestimate any team at this stage- we’re not at that stage and I thought we prepared really well for it, but we came out and put in a disgraceful performance. The 47-year-old refused to put the defeat down to their approach to the build-up. “I thought we prepared really well,” he said. “I thought we were ready to play and as ready as we’ve been to play a game this year so to dish that up… We were still in the contest at half-time and just after half-time, it got close. But once the gap opened, the floodgates opened and it’s just not good enough for us. “We’ve had two big defeats - one at home and one away now - and we’re kidding ourselves if we’re anywhere near right now.